CENTRAL POINT, Ore. - Nov. 15, 2018 - PRLog -- There's something interesting about the alchemy of herbs and smoke. Part of it is watching it. We can see the plants undergoing a fiery physical change as they are transformed into smoke and ash. It is also something that we can experience as we breathe in. The smoke has a taste and a texture, and it resonates with us at an emotional and physical level. This blend helps to break the craving cycle, ease nerves, open the heart, and heal the lungs. Enjoy this daily smoke, organically grown and sustainably wildcrafted in Southern Oregon. All Organic Ingredients: Lobelia, Catnip, Skullcap, Mullein leaf and Rose petals. Tobacco-free! All these organic botanicals are blended in small batches, making an ideal alternative to tobacco cigarettes. Recreation, medicine, and spiritual ceremonies have all shaped the history and ritual of smoking herbs. Smoke this at the dark and the full of the moon to increase your visionary powers. Many people report altered perception due to the Motherwort, and vivid dreams, courtesy of the Mugwort. All Organic Ingredients: Motherwort, Nettle leaf, Hops, Mullein leaf, Mugwort and Damiana. Organic & tobacco-free! May be smoked alone or mixed with other smokables. This organic herbal smoke is a delightful blend of herbs that will make you drowsy and enhance your dreams while you sleep! A wonderful smoke before bed. The taste is delightful and gentle on the lungs. This makes a great, healthier alternative to tobacco. Can also be used as a tea. All organic ingredients include Mullein leaf, Skullcap, Catnip, Mugwort, Lemon Balm, California Poppy, Hops and Lavender. Tobacco free! Sun God Medicinals was founded in the Summer of 2014 with a mission to blend & extract quality healing herbs from Southern Oregon to help consumers address specific symptom needs. From herbal teas, tinctures, elixirs, topicals, edibles, and extracts the Sun God Medicinals product line is aimed at providing specific relief. The company produces both an herbal products line, hemp product line, and a cannabis compounded line of products. 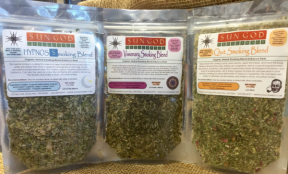 The Sun God products are made from naturally grown herbs cultivated and harvested on small, family farmsteads in Southern Oregon. They search for herbal supplements grown as nature intended, in small-batches, to ensure quality. They use ingredients that are sustainably wildcrafted and certified organic whenever possible.